Early in the history of humans on this planet, a group of people made their way across a bridge of ice; the sabercat and the woolly mammoth following closely behind. Think about that for a minute. A bridge… across the ocean… made of ice. Regardless of how humans came to populate the Rocky Mountain region, the real story is, and will always remain, unknown. Not that there’s anything wrong with the ice bridge theory but if you really break it down it sounds a bit unlikely but I bet the ice fishing was incredible. The Estes Park and Rocky Mountain National Park Area was home to native peoples for thousands of years and have built some amazing monuments to the practice of gathering food. Specifically, ancient game funnels that herded animals into the ideal position for an ambush. These walls resided high up on distant peaks, offering the best chance of quickly killing and butchering a large amount of animals for the tribe. This not only allowed them to live comfortably throughout the winter but created lasting evidence of their activities for future generations to see. If you know where to look, you can see these ancient stone walls in and around Rocky Mountain National Park—but if you want to see an often overlooked Native American hunting area, look no further than the streams and rivers of the Front Range. Native Americans have been fishing these waters since the Mammoth roamed what is now the I-25 corridor, grazing the tallgrass prairies of Eastern Colorado and fighting with giant sloths over territory. (Ok maybe not.) Fishing was an integral part of their everyday lives and it is speculated that they would have utilized dry flies as well as various fish trap apparatus. It would stand to reason that Natives would have developed flies that mimic natural insects, due to their intense immersion in the natural world. Natives made fish hooks from the bones of animals and devised ingenious ways of catching wild trout, it would only make sense to utilize flies. 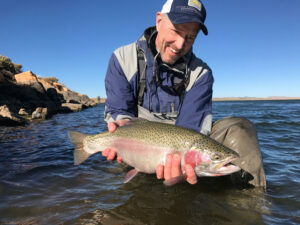 The popularity of fly fishing in Colorado and the U.S., can be traced back to England as the English are rabid fly anglers. It is even said that Shakespeare was a fly fisherman. The craft was really honed in the early 19th and 20th centuries and became a fully valid form of fishing for trout in the streams and rivers of North America. The idea of catching a fish through an imitation of a natural insect or animal is to outsmart the fundamental survival instincts of the fish—a method which the Natives utilized for their survival. 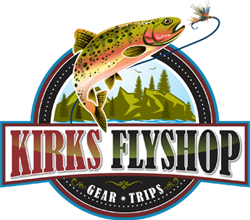 At Kirks Flyshop we cherish this heritage as western anglers and invite those from all over the world to come and experience our world. Standing among the pines, tying on a Royal Coachman, letting the line sing through the air and dropping the fly with a gentle kiss to the water. Hoping against hope, that the fly will send a rainbow into a strike. Like a gambler pulling on a one-armed-bandit, once you feel the line zing off of your reel, you will cast thousands of more times just to feel that rush of the chase. At Kirks Flyshop we understand these primal emotions and have made it our mission to share it with the rest of the world. Fly fishing, like anything worth doing, can be a challenge to get the hang of, which is why we have some of the most experienced guides in the country at your disposal. We will provide all of the gear you will need to get on the water and experience the pure, almost spiritual excitement that fly fishing can provide. No worries if you lack the training or experience, we teach thousands to fly fish every year, from all walks of life. Our guides are as passionate about making sure that the client catches fish as they are about teaching technical abilities. Any skill level is invited to join one of our 4,6 or 8 hour guided expeditions to one of our proven fishing locations. We even offer a 2 hour evening hatch session for maximum action with professionals who can match the hatch and put you on fish. If you are looking for the ideal experience this summer, contact Kirks Flyshop for a guided fly fishing expedition and walk in the footsteps of the ancients.